Higashiyama Onsen (東山温泉) is Onsen with many waterfalls located in Aizu-Wakamatsu. There is Onsen spring which Hijikata Toshizo, the vice commander of Shinsengumi, uses for his medical treatment during Boshin War. There are many Onsen Hotels, and there is public foot Onsen. It is also famous for its local Sake. There is a parking. 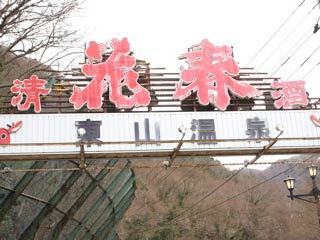 There is a shooting range, the popular Onsen entertainment. 1. use local bus to Higashiyama Onsen. The Onsen spring was found by Buddhist priest Gyoki in late 8th century. During the Edo period, it became a medical Onsen for Aizu domain, and it became a resort spots for Aizu people.